Rhubarb Pie, a homemade lip balm, made by Spencer's Farm had a unique rhubarb flavor with a combination of sweet and sour taste. This natural lip balm soothed dry, chapped, lips with long lasting moisturize. It smoothed lips, with a hint of shine. It glided on lips with no medicinal after taste. Many people enjoyed having smooth and beautiful lips! Discover benefits and cautions of rhubarb for body and skin! 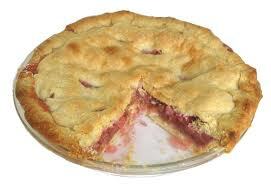 Find rhubarb pie and other homemade recipes! Discover tips for growing rhubarb! Rhubarb is a perennial sour vegetable, but in some regions of the world it’s classified as a fruit. It resembles celery stalks, with dark red to pinkish streaks. The stalks can be eaten raw but the leaves can be toxic. Trim and remove all leaves before using the rhubarb plant. Rhubarb is very fragile. Cut the stalks, wrap tightly in plastic and store in refrigerator up to 3 to 4 days, then discard. Stop by your local grocery store. Look for firm, crisp, rhubarb stalks, with no indentations or discolorations. Edible stalks are used in rhubarb pie, preserves and wines. The distinct, sour, rhubarb flavor should be accentuated rather than hidden. Share rhubarb flavor with strawberries or ginger to add sweetness. BENEFITS OF VITAMIN A: Improve bone metabolism, guard against heart disease, help prevent night blindness, help eyes adjust to light changes, contain antioxidants, promote strong bones, guard against viral infections and strokes. BENEFITS OF VITAMIN C: Help prevent cardiovascular disease, inflammatory disease, diabetes, eye disease and duration of common cold. Protect immune system. Has antioxidants to combat free radicals. Has a natural antihistamine. Speed recovery of broken bones. Reduce stress. VITAMIN C CAUTION: Too much vitamin c can be toxic. According to the Mayo Clinic, the recommended daily intake of vitamin C for adults is 65 - 90 milligrams per day, up to a maximum of 2,000 mg per day. Doses over this amount may be considered an overdose. Contrary, don't be vitamin C deficient. Maintain a proper balance for a healthier you! - GOOD MINERAL CONTENT: calcium, iron, potassium and manganese. - LOW IN CALORIES. Great addition to other foods when losing weight. Rhubarb is a natural antibacterial and anti-fungal agent, protecting against skin infections. Guard against bacterial and parasitic infections. It contains several chemicals which may help heal cold sores. Its natural antioxidant, attacks free radicals that speed up visible signs of aging. Fade age spots. Diminish fine lines and wrinkles. Prevent free radical cell damage. Its vitamin A content keeps eyes, skin and mucous membranes moist. It improves skin conditions like acne and psoriasis. Help skin look youthful, with a radiant glow. Find other homemade skin care tips, now!